We stand at the precipice of a new Eve: Citadels stand to change how we live and fight in New Eden, Valkyrie is posed to expose millions of new people to the EVE universe, and recently we have received confirmation that the next generation of first-person shooter set in the EVE universe will be on the PC. However, it seems that people still neglect some of what CCP has shown us and how what they are doing now plays into the larger picture. Let us take this opportunity to glance into the crystal ball, to see a potential future of EVE Online and discuss how it could be possible. The Citadel is ready to come out of reinforcement. The Citadel is important because it is a major staging base for an alliance. Arrayed around the Citadel are the various other structures that form the backbone of this forward operating base. The defending fleet stands by as the timer ticks down. The attackers land on grid in the fight goes underway. From 400 kilometers away the beacon is lit and a small contingent of carriers and support come through. The carriers are fitted with a CRU, and proceed to launch special fighters containing ground forces. The fighters screech their way towards the Citadel and dock by blasting a hole in the side. Meanwhile, the people inside of the Citadel are lying in wait for the breach. The invaders attempt to secure key places within the structure and if they can do so they lower the resistances, increase the damage cap, or lower the defences of the Citadel. Meanwhile, the carriers in space must continue to use their support squadrons to resupply the soldiers inside, and if the carriers are shot down, any clones they hold in reserve in their CRU are lost. This scenario sounds quite amazing, however, it is also relatively reasonable. CCP has worked hard in the correct ways to make this future a reality, and do so far sooner than many people expect. 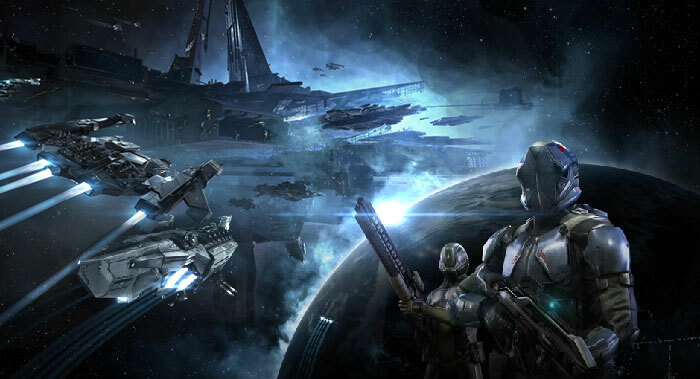 Citadels play a big role in the future vision of EVE Online. It is not by chance that they were the first major structure to be put in. All one must do to understand the purpose behind Citadels towards the new Eve is look at one of the screenshots from the XL Citadel test (or check out our video review! -Ed). The fight was enormous, consisting of many super capitals, but the Citadel itself towered over them all. The Citadel along with other structures will provide visual context to anyone who is viewing screenshots or videos of Eve. This will go a long way in helping people understand what makes EVE impressive. However, many seem to not realize that Citadels are not in fact POSes or outposts. They cannot do assembly or research. In fact, there are nine other roles for structures that are not market hubs and administration offices, which is all Citadels were meant to be. Citadels represent the beginning of our occupation of space under this new paradigm. It is also worth noting that absolutely no development effort was put into trying to integrate captain’s quarters, however, Citadel interiors have been confirmed. The new project is mostly early in it’s development. To address the last point first, we know from the post that they plan on giving tier-based rewards to the players of the original Dust. This is a clear demonstration that progression isn’t being transferred directly. Chances are loyalty will be rewarded with packs of equipment, or potentially some starting SP in some form. This is a departure from what they said back when we were talking about Legion. Given the passion that was shown during that time for things like transferred progression, the only reason why they would do this is if progression as we understood it in Dust was obsolete. They have also specified that the new “not-Dust” will be in done in Unreal 4, which is profoundly wise, and makes a lot of sense if you understand the last year of CCP as a company. For those of you who don’t know Unreal Tournament is a highly popular FPS from back in the day. However, the game almost functions as an advertisement for the main product: the engine itself. The Unreal Engine is a famously powerful and versatile 3D rendering engine used from everything like Mechwarrior Online and Bioshock Infinite, to Dungeon Defenders and Gears of War. Dust 514 itself was built in Unreal Engine 3. The newest incarnation of Unreal Engine is still bleeding edge, but it really shouldn’t be any surprise why CCP would be going with a choice like this. Valkyrie has done a lot to the game company, and it has opened up doors in a big way. In the last year, CCP developers have been working hand in hand with the folks over at Facebook, Oculus, and likely other game building groups. The kinds of people who work on these new tools are highly collaborative, and CCP can learn a lot from these other teams. Furthermore, there is likely also some cross-pollination, bringing needed talent and ideas to the vikings. In many cases in fact, CCP is being used to show off not only Occulus tech, but thanks to Unreal 4’s strong tie-in with native 3D rendering, also demonstrating some of that technology. It is also worth noting that the models used in that last video are EVE pilots, not Valkyrie pilots, or mercs. The Captain’s Quarters was originally meant to be a jewel in CCPs crown. The herald of a new age of EVE Online. In fact, the idea was that the technology used to create the CQ, CARBON, was to be so powerful, that CCP was planning on licensing it much like Unreal Engine. However, in a post Summer of Rage world, CQ mostly stands as a testament to possibly the greatest mistake CCP ever made as a company. We know that for EVE to grow past a certain point, CCP will need to challenge their fear of this feature, and make it what it needs to be. Thankfully, production on CQ halted very early, which means the number of functions that would need to be replaced is far reduced. If one simply needed to replace the current functionality of CQ, Unreal could likely do so whole cloth without too much effort, the true power lies in where you go from there. Without the complications of trying to make a new engine actually work to do the things you need, you already have one ready to go. With these few commands you could fully integrate a breach force and the space fight. Additionally, with structures having set timers, having fixed pivotal battles inside is quite possible, a promise Dust never quite delivered on. So, while it is possible that the above won’t come to pass, we are closer to it than ever before. For years EVE has been defined by its own restrictions. However, the last few years have gone a long way to removing those restrictions, and reinvigorating the dev team to tackle even harder ones. Additionally, the suits of armor discussed back in November are back, and as of this writing are part of the Project Discovery rewards. The signs are all there, my crystal ball can see them. Then again, I get great reception with all this tinfoil.